After gaining fame and visibility with Tamil soaps Ahalya, Selvi, and Arasi, this popular Indian television host Dhivyadharshini forayed into television scene, hosting a number of shows including talk shows Koffee with DD and Anbudan DD. She has also starred in films such as Saroja and Power Paandi. Dhivyadharshini was born on 17 February 1985, in Chennai, Tamil Nadu, India. attended Our Lady’s Matriculation Higher Secondary School and earned her undergraduate degree from Anna Adarsh College, Chennai. 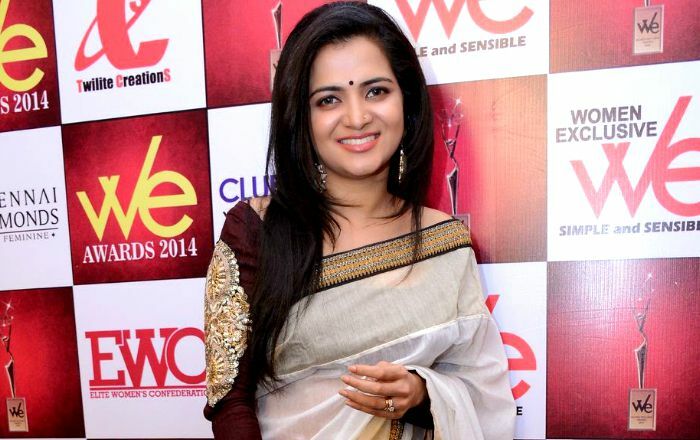 After dating for six years, Dhivyadharshini tied the knot with Srikanth Ravichandran, an assistant director of Gautham Vasudev Menon, on 29 June 2014 in a grand wedding in Chennai. The couple parted their ways in 2017 citing differences and their divorce was finalized in early 2018. As a child artist, DD appeared in the 1990 Malayalam film Shubhayathra and went on to cast in supporting roles in over a half dozen of movies. In 1999, DD debuted on television as a host with the show Ungal Theerpu on Star Vijay. Her roles in Tamil serials such as Selvi and Arasi. Bring host on the popular TV shows Jodi Number One, Boys Vs Girls, Jodi Number One, Koffee with DD, Airtel super singer T20, Achcham Thavir and Anbudan DD. She has appeared in a number of TV commercials and print ads for brands such as Europe Study Centre, Indhulekha Hairoil Ad, and many others. She began her acting career when she was a child. She was cast in supporting roles in several films like Julie Ganapathi, Nala Damayanthi, Whistle, Saroja, Power Paandi, to name a few. She bagged the prestigious Vikatan Awards for Best Female Anchor for the show Koffee With DD in 2014. She worked with Vijay TV for over a decade and has hosted several shows including Jodi Number One, Boys Vs Girls, Jodi Number One, Koffee with DD, Airtel super singer T20, Achcham Thavir and Anbudan DD. In addition to acting, she voiced for actors Vega Tamotia and Piaa Bajpai in Saroja and Goa, respectively. She won the Vijay Television Awards for Best Female Anchor in 2015 and 2016. Her 2018 release includes Dhruva Natchathiram and Sarvam Thaala Mayam.